Description: This monument is a tall, tapered marble column with a small sphere atop. The shaft, weighing twenty-five thousand pounds, is constructed of eight sections, with an angular capping detail below the orb. The front face is inscribed to the memory of the Cabarrus County Confederate dead. 1861 - 1865. / In Memoriam. / This Monument Is Erected To / the Memory of the Confederate Dead / of Cabarrus County, N.C. / With granite and marble and branch of the cypress / The emblem of peace shall thy slumbers enshrine. / Then take this memento: 'tis all we can offer. / O graves of our comrades, this tribute is thine! Unveiling & Dedication: The monument was placed in April 1892. Many attended the May 5 unveiling at the courthouse. According to the Confederate Veteran, Major W. M. Robbins was the speaker of the day, having been escorted by a large procession led by the Concord Black Boys' Drum Corps. The thirteen Confederate States were symbolized by thirteen small girls in Confederate uniform. A choir sang, and Dr. C. M. Payne gave a prayer. Four small girls unveiled the monument, and the event concluded with the singing of "The Old North State." Post dedication use: In her 1941 book, Blanche Smith observed that every year on May 10, Confederate Memorial Day, school children developed the custom of covering the monument with flowers. Location: The monument sits in front of the old Cabarrus County courthouse on the east side of South Union Street. It faces roughly west. 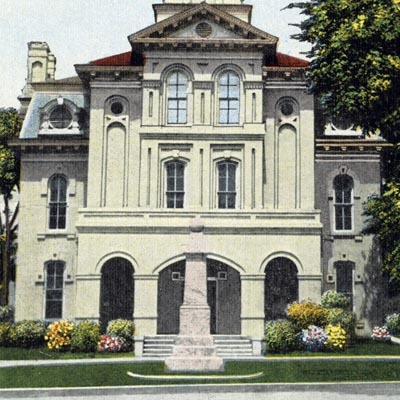 Landscape: The monument sits in the lawn area in front of the entrance to the courthouse. I was one of those children who marched with my flowers to this confederate monument. Shame on adults and teachers for not telling us the truth about this war. Bring it down!